The impulse to sing is as ancient as the universe itself. Many cultures have been kept alive through the power of singing. In the very early days, this is how wisdom was preserved and passed down from generation to generation – through singing. Singing is an intrinsic part of every being and every tradition. Why has this practice endured throught the ages? The answer is fascinating. Although in religious traditions, the singer uses his voice to glorify God, it is the singer himself who receivees the greatest benefit. Sing and see what happens to your heart. Sing and see what happens to your very being. Singing opens the heart and the door to paradise within. When difficulties come before you, sing to them. Singing removes barriers, uplifts and refreshes your spirit. Singing can lift you out of the labyrinth of thoughts that cause you to suffer, to feel sad, anxious, and afraid. So sing! Everyone can sing. Find a simple song you love – or a chant or a prayer – that makes your whole body feel gooooood. Memorize the words. Memorize the melody. And just sing it all the time. Tune in tomorrow for my interview with Dr. Connie Corley on her show Experience Talks on KPFK, 90.7 FM. This is so exciting becuase its my first interview on FM radio in Los Angeles. I’m very honored to have been invited by Connie. Vito and I will be debuting some new tunes set for release later this year. So take a break from the super bowl and join us with a warm cup of tea for good chat and music. 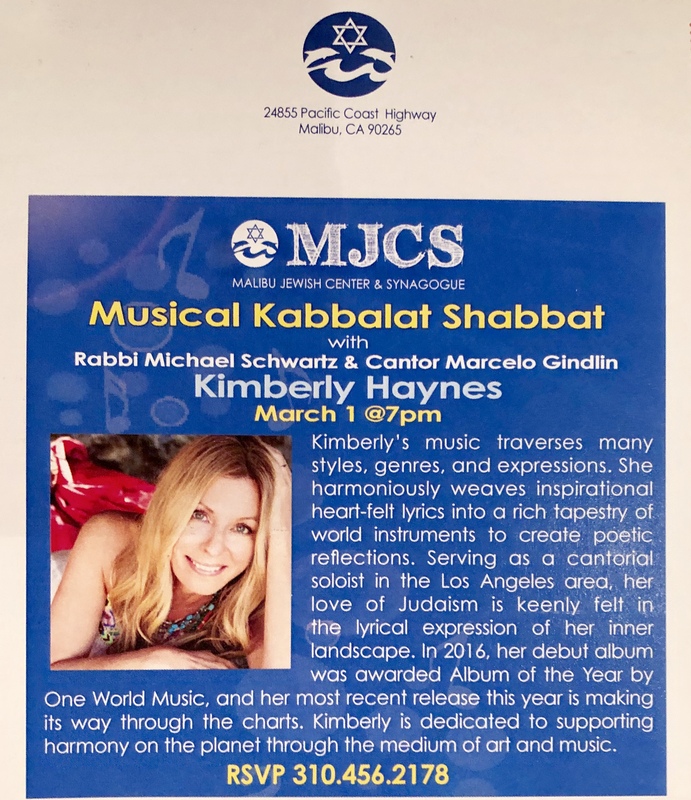 I’m delighted to have been invited as the musical guest for the Shanti Shabbat series at Malibu Jewish Center on March 1. We will be sharing songs and prayers rich with Jewish inspiration together with the remarkeable Cantor Marcello and Rabbi Michael Schwartz. I love my malibu community and I’m so looking forward to sharing a night of music and meditation and joyous celebration of life. Every voice is entirely unique. As unique as your thumbprint. That’s what makes the voice so exquisite. You might notice how someone’s voice will be the thing that makes that tingle go up your spine. The vibratory impact of the voice is powerful. Most of us don’t learn how to use our voices effectively. Many have been told not to try – a painful disconnect from the one’s most impactful source of expression. If you are a speaker, teacher, chanter, singer, or that person who has always longed to explore but felt blocked, this one-day workshop is for you. I have scaled the workshop back to just one day, reducing the cost, and making it more accessible for busy lives and for those who want to dip their toes in the water, so to speak. 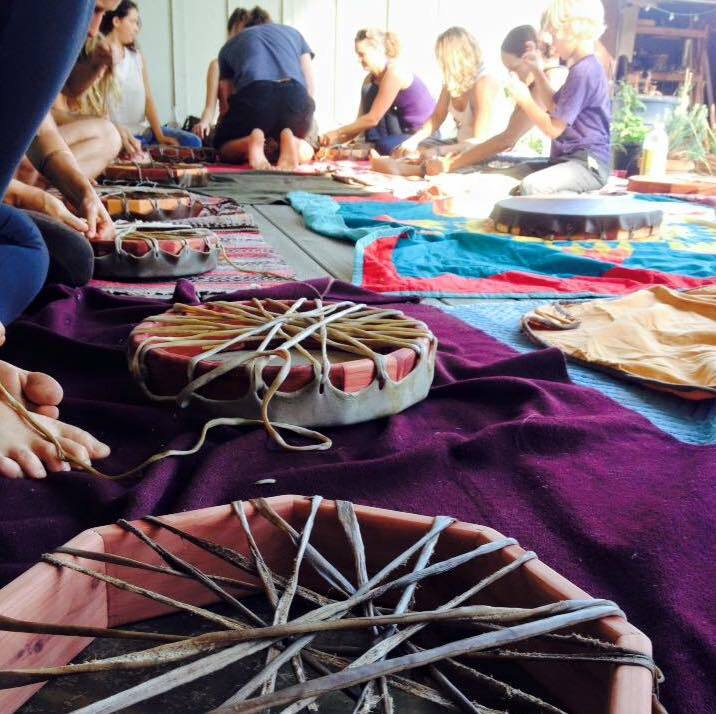 Come and join me, in the creation of your very own native style hand drum with master craftsman Justen Bear. All material are prepared and provided. The hides are elk, buffalo and horse, hand selected and dried with red cedar rims. The beaters are hand selected from the forest and with buckskin tip. As we craft the drums, a Life Creation and Self Reflection Story will be shared enhancing your personal connection with your drum. An Experience of a Lifetime. Your Drum will become an extension of yourself… And also a new Being in our Life! $350 per Drum. A $150 refund will be given, if you choose to cancel. This class is limited to 10 people and will fill up.